Everyone’s favorite anti-war scarf is back, still in four hott colors. man this is so tired. the French hipster/pseudo-revolutionaries/counter-culturalists were rocking these in like – what – ’96? American douchebags have always been so far behind the Euro douchebags. sad really. It is because people will forget and kids like the ones in the youth group I work for will wear them and not know any better. I asked one of the girls on this youth group trip I was working at if she knew what kind of shirt she was wearing (it was a blouse made out of a red kafiah) and she said it was her sisters. When I told her what it was she freaked and asked me why Urban would sell such a thing…I told her because her sister would buy it. This is all about money folks, and until all the douche bags, both Euro Trash and LES Parent-Supported-Alternative-Life-Style folk, stop thinking this is a fashion statement, we will continue to see our fav anti-war scarf for sale at (sub)Urban Outfitters. who cares? what’s wrong with a freedom fighter scaf? even i people are supporting the Palastinian people, or it’s just a bit of harmless fashion – why do you get your knickers in a twist? do you believe that there’s a world conspirasy – to hate the Jews and Israel? 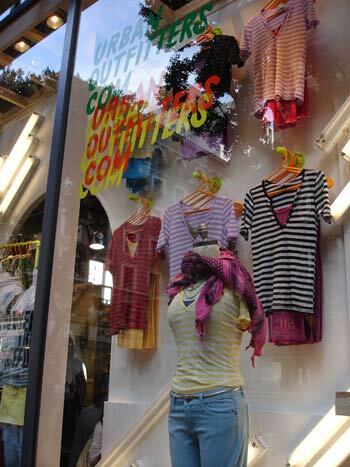 – I bet in a few weeks time it turns out the “Jews” own Urban Outfitters and the suppliers of these scarves are Israeli. Give me a break and wrte some real news! Was the original pull from all Urban Outfitters stores, or just American ones? Because they never disappeared from the stores in Montreal… A friend of mine has been going in to the shop on Ste-Catherine every week to take photos of the scarves on display. I’m not sure what she’s going to do with the photo collection, but hopefully something creative. Because the different keffiyeh colors have significance (pre-Urban Outfitters at least) I have a vintage hot pink keffiyeh-like scarf that I’ve always referred to as my Gay Druze Kaffiyeh. I saw the display of these in the Urban Outfitters here in DC and thought I’d inspired a following. I still choose to believe that. The French Connection store on Sixth Avenue in NYC featured a mannequin wearing an “anti-war” scarf draped insouciantly around his plastic neck. Click on my name to see the picture I snapped a couple of days ago. It would be “just a scarf” if they called it a “kaffiyeh” or “Palestinian” scarf or something like that. I don’t have a problem with them selling them, but calling them “anti-war” insinuates that the Palestinians only want peace and if it weren’t for those damned Jews, they would have it. I’d also like to say that I support Jews wherever they are but do not agree with many of the decisions of the Israeli government. I also agree that Palestinians have been persecuted, but to call it an “anti-war” scarf is absurd. I agree with Max. honestly, no body has bad intentions. People, should stop looking for something to talk about. they are just scarves. me and my friends have some and we didnt buy it for anti-war reasons. they’re cute. so what? and anyways if this all because some arabs were wearing keffiyehs while duoing the nazi salute then shut up bc if those men were wearing Prada shoes (or wtvr brand) then why arent u writing letters of complaints to that company. the jewish cap might be ins tyle some time and i promise you arabs will not be writing letters of complaints to get them off shelves. FOCUS on real issues. 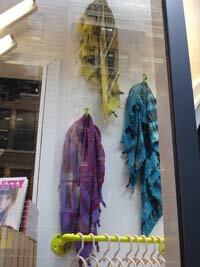 not anti-war scarves being sold at Urban Outfitters. if your against them being sold, don’t buy them. thanks. Oy Bay Dragnet « Oy Bay! Where can I get a keffiyah Yisraelit at a reasonable price? ISLAMOfashion — a hilarious mock-umentary KABOBfest.com created about the kuffiyeh kraze. You’ve got to check it out! Keffiyeh’s are definitely cool. I’m gonna get one now after the Anchor baby Malkin incident with Dunkin Donuts. Its a scarf people, for crying out loud. I also live in Montreal, see them all the time, and dont see the big deal. How would you peeps feels if some of us kvetched every time we saw Stars of David on clothing or advertising?